Clever use of colours and textures can really make a room ‘pop’. Wallpaper trends change often so we’re constantly in touch with all the big names to keep up with their latest releases. 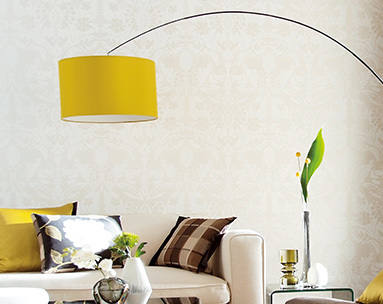 We have sample books from companies such as Sanderson, Designers Guild, Arte & Chivasso that are sure to inspire you. Whether you’re after just a few rolls to create an eye catching feature wall, or you want enough to do the whole house, we have a great range of colours and textures to choose from. Thinking about a combination of wallpaper and paint? We offer a Colour Consultancy Service that will help you achieve a cohesive look and ensure a smooth flow throughout your home.